First off, be sure and come back tomorrow when we'll have news, updates, discussion, pictures, videos and general commentary on what is going on inside Butts-Mehre Heritage Hall. I'll have a recruiting twitter feed automatically pulled in to give us real time updates. Pictures and video will start slow as there's really nothing but the doughnut table and ticket window. But around 11:00 or so (roughly an hour and change after Montravius Adams' announcement) the coaches will come out and speak. Maybe even a surgically repaired Coach Richt! It should be a fun day. The Commitments - the biggest storyline for Coach Richt's 13th class at Georgia will not only be the total number, but also how many committed and then never wavered. Well, the ringleader Shaq Wiggins wavered some before being talked back off the ledge. But seriously, there isn't one kid among the 30 that is expected to to even consider another program when they sign their letter of intent tomorrow morning. That is impressive. In a recruiting season that has seen drama of epic proportions nationwide, that story arc has been very, very refreshing. Montravius Adams - His intentions have been expressed to each coaching staff and apparently Alabama and Clemson are out. So the biggest target left for Georgia is evidently down to a battle between Todd Grantham and former UGA coach Rodney Garner. How appropriate. Rumors are swirling that Auburn now leads, but Georgia is heavy on Adams' mind. New defensive line coach Chris Wilson has done everything he can to comfort Adams during the transition, but clearly Garner still holds some pull. Mom loves Athens. So there is that. George Adeosun - This appears to be a battle between Georgia and Virginia, the first FBS school to offer the kid. Since all of this has developed rather quickly in the last couple of weeks there is a lot of parts ($) in play here. For one, Georgia coaches are selling their program hard, but have had to do that mostly over the phone. Adeosun visited Charlottesville a couple weeks ago. Like with Adams, there is a feeling that the family in on our side. But the kid may be leaning in a different direction. Davin Bellamy - His signature is completely connected to his trust in Grantham. If he signs it will be because he believes Georgia's defensive coordinator is not packing any boxes any time soon. Davin has clearly fretted over rumors of Grantham taking another job. Keep in mind that this was a kid that was committed to FSU for a while then had to reopen the process fully when some coaching changes forced him to. So far he's been comforted so much by Georgia that he's been open about his intentions to sign with them. We'll see if he still feels that way tomorrow. 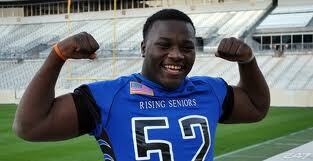 Surprises - Many Dawg fans will head into tomorrow hoping one of the big targets has a trick up his sleeve. Slowly in the last week names like Foster, Kamara and Tunsil have fallen all but off the radar. Well...don't hold your breath. I think there's a better chance we have a last minute name pop up, much in the way Kenarious Gates did a couple years ago. On the other side of the coin, if Adams chooses Auburn it will be a devastating blow just before the closing bell. If Bellamy loses faith it will get very awkward in Athens very quickly. And if Adeosun signs elsewhere we may kick ourselves for not offering sooner. That's the thing about surprises: they can only lead you in one of two directions, and sometimes it's not the way you were hoping. But in the end, let's all remember two things: we've got a great and historic class before the sun even rises tomorrow, and by the time the sun sets we'll only have the ones that truly wanted to wear the G.
Get a good night's sleep y'all. Gonna be a fun day!